Spotting is the use of dyes or pigments to correct white specks and lines produced in the print by opaque defects or dust on the negative. Spotting is usually done using dyes such as Spot-Tone, which have the advantage of darkening an area without appreciably altering the surface reflectance. The dyes are available in several colors, and frequently two of them must be mixed to arrive at a coloring that matches the print exactly, particularly a toned print. There is some question about the permanence of spotting dyes; some may have a tendency to darken and turn blue in time. If a dye spot must be removed, be sure to use a dye remover recommended for the particular type of dye used. 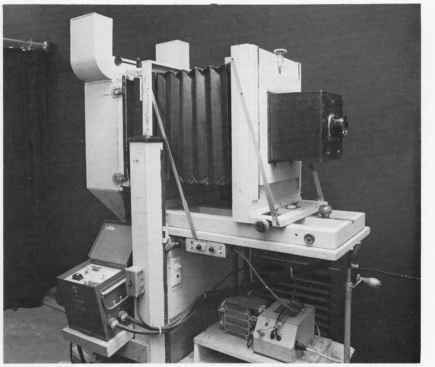 Figure 7-9. The overmal. The beveled edge of the overmat can be seen. The print has been dry-mounted, and the overmat is cut slightly larger to leave a border on all sides. A wider border on the bottom edge leaves room for a signature just below the print. In practice, I do not sign a fine print until it is completely finished, including mounting, spotting, etc. Figure 7-10. Print spotting. Small spots and defects are removed using dyes and a fine brush. Good light is essential, both to judge the dye density required and to match the color. Figure 7-11. Print spotting. Use a stip pling motion to apply the dye, rather than "painting" it on. A good-quality brush is very important. Weston's spotting solution. This method gives rich blacks (and other values if diluted), with a good gloss that closely matches the surface of an unferrotyped glossy print. The print should be placed under strong illumination, and should be carefully wiped free of dust specks that may appear to be defects in the image. Protect the surface of the print with paper, especially in the area where you will rest your hand. 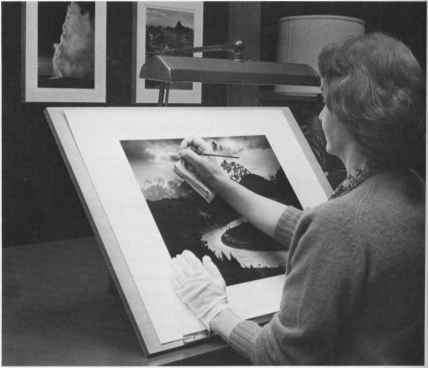 A black paper with a hole cut in it will minimize eyestrain and provide good protection against the possibility of dropping the brush on the print or mount. I also strongly advise wearing white cotton gloves (available at camera or art supply stores) during this and all other handling of negatives and finished prints. The application of the spotting color to the print should be done with a good-quality brush like the Windsor and Newton Series 7 finest red sable brush — usually a No. 0 or No. 00. A high-quality brush will have enough bristles to hold the spotting fluid while still coming to a fine taper point that affords good control. The brushes sold in camera stores for spotting are often of inferior quality, and it is well worth a trip to a good art supply store for this important acquisition. Mix the spotting colors to match the general color of the print, and test by applying to a discarded photograph on the same paper as the actual print. You can dip the brush in the spotting color and then lightly in water, or you may prefer to dilute the basic spotting color with one or more parts of water for middle to light values. 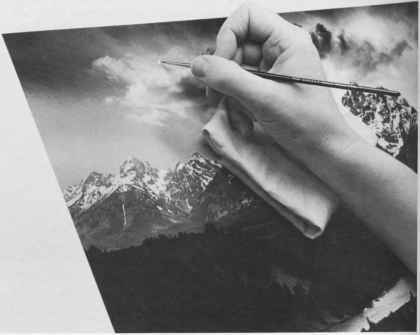 Usually a fairly dry brush works best; after dipping the brush in the spotting color, remove most of the solution by wiping it lightly on a piece of plain paper before touching it to the print. It is best to build up the required "density" by repeated applications of the dye. However, if you apply too much dye you can usually reduce it by pressing immediately with a damp cloth. Since the dye may darken over time, you should leave the spotted area slightly lighter than its surround. see Appendix i, page 194 mula (F-24), at least for the second fixer. 4 RC papers can be very hard to spot, as the dye does not readily penetrate the print surface. 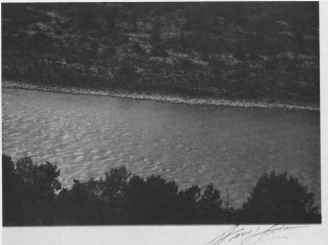 Where a very faint speck or line must be removed, I have often found it satisfactory to apply lightly a soft or medium pencil, rubbing the print gently with a soft cloth after application. Never press hard with a pencil, or you will have a permanent depression on the print. A pencil can also be used on middle- or high-value areas that have been spotted almost, but not quite, to the final value required. Real skill is required to spot larger areas. It is usually best to stipple the areas to equalize the values and approximate the effect of image grain. You may also wish to repair such defects on the negative, to avoid or reduce the spotting of prints. In dire cases a defect in a reproduction print may be most effectively repaired by an airbrush expert, but I would never allow airbrushing of a fine print.